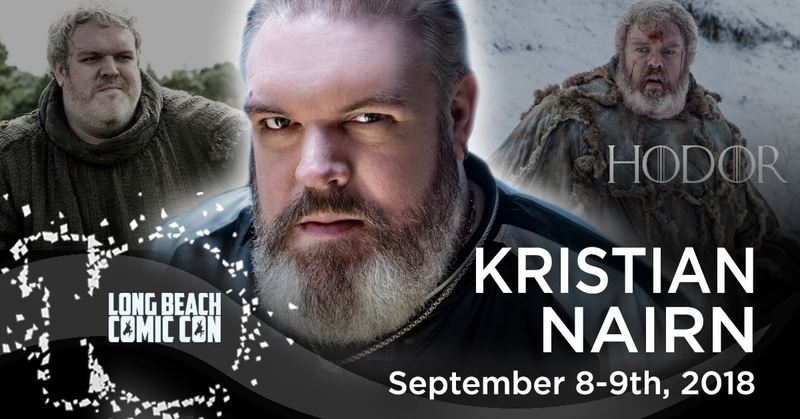 You don’t wanna miss this incredible chance to get up close and personal with Game of Thrones star Kristian Nairn, otherwise known as the beloved Hodor. Kristian will be at Long Beach Comic Con this September taking selfies with fans, doing professional photo shoots, signing autographs and hosting a Q&A session on Saturday. Tickets to Long Beach Comic Con are on sale now! Kristian won’t be the only star in attendance! The esteemed comic book and pop culture event will also host special guests behind Black Panther, Deadpool, X-Men and Guardians of the Galaxy. Additionally, talent from some of television's most adored shows and films will be there, including stars from Power Rangers, Battlestar Galactica and the Emmy-nominated Twin Peaks. During its 10th edition celebration, Long Beach Comic Con aims to please the masses with exciting, action-packed exclusive events such as the KnoX PRO Wrestling Ring, GeekFest Film Festival, an interactive Space Expo and LBCC’s own official Cosplay Contest! But don’t forget, LBCC is comics-first, meaning comics and the talents behind them get the front seat and are always the core focus!